For the mixing of plaster of Paris for any purpose, add the plaster gradually to the water, instead of the contrary, says the Master Painter. Do not stir it, just sprinkle it in until you have a creamy mass without lumps. Equal parts of plaster and water is approximately the correct proportion. The addition of a little vinegar or glue water will retard the setting of the plaster, but will not preserve its hardening. Marshmallow powder also retards the setting. In this way the plaster may be handled a long time without getting hard. If you wish the plaster to set extra hard, then add a little sulphate of potash, or powdered alum. Don't pull a lamp hung by flexible cord to one side with a wire and then fasten to a gas pipe. I have seen a wire become red hot in this manner. If the lamp hung by a cord must be pulled over, use a string. Push a pin through an ordinary business card and place the card against one end of a spool with the pin inside the bore, as shown in the sketch. Then blow through the spool, and it will be found that the card will not be blown away, but will remain suspended without any visible support. This phenomenon is explained by the fact that the air radiates from the center at a velocity which is nearly constant, thereby producing a partial vacuum between the spool and the card. Can the reader devise a practical application of this contrivance? A brilliant polish may be given to tarnished nickel by immersing in alcohol and 2 per cent of sulphuric acid from 5 to 15 seconds. Take out, wash in running water, rinse in alcohol, and rub dry with linen cloth. By rewinding an electric-bell magnet with No. 16 wire and connecting it in series with two electric-light carbons, as shown in the sketch, a small arc will be formed between the carbon points when the current is applied. In the sketch, A is the electric-bell magnet; B, the armature; C C, carbon sockets; D, carbons, and E E, binding posts. When connected with 10 or 12 dry batteries this lamp gives a fairly good light. --Contributed by Morris L. Levy, San Antonio, Tex. 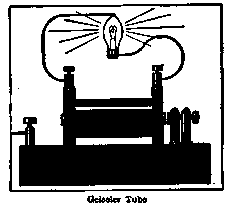 An incandescent lamp of low candlepower may be illuminated by connecting to an induction coil in the manner shown in the sketch. One wire is connected to the metal cap of the lamp and the other wire is fastened to the glass tip. If the apparatus is then placed in the dark and the current turned on, a peculiar phosphorescent glow will fill the whole interior of the lamp. The induction coil used for this purpose should give a spark about 1/2 in. long or more. --Contributed by Joseph B. Bell, Brooklyn. Don't wrap paper around a lamp for a . You might go away and forget it and a fire might be started from the heat. Use a glass or metal . That is what they are for. Radium acts upon the chemical constituents of glass, porcelain and paper, imparting to a violet tinge; changes white phosphorus to yellow, oxygen to ozone, affects photograph plates and produces many other curious chemical changes. Not many amateur photographers possess a ray filter. A good substitute is to use the orange glass from the ruby lamp. This can be held in position in front of the lens with a rubber band. A longer exposure will be necessary, but good cloud effects can be procured in this manner. Take an electric light bulb from which the air has not been exhausted and immerse it in water and then break off the point. As there is a vacuum in the bulb it will quickly fill with water. Shake the bulb gently until a part of the water is out and then screw the bulb into a socket with the point always downward. Apply the current and the heated air inside will soon expand and force the water out with great rapidity. Sometimes this experiment can be done several times by using the same bulb.-Contributed by Curtiss Hill, Tacoma, Wash.
On its official trial trip the British torpedo boat destroyer "Mohawk" attained the record speed of a little over 39 miles an hour. The pain of carbolic acid burns can be relieved promptly by washing with alcohol, if applied immediately. If too late for alcohol to be of use, brush with water containing saturated solution of picric acid.